Disclaimer: I met Goddess Organics at Expo West and they were kind enough to send me product to try out. All opinions are my own, no other compensation was received. So when I turned 30 I realized I needed to get on the skin care regimen a bit more. the years of performing with marching bands and being a summer-loving SoCal girl I had a couple spots, a few lines and after children, I suddenly burnt a lot quicker. 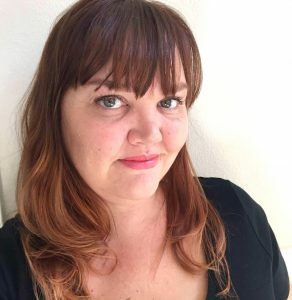 I don’t like using a lot of makeup, but acknowledge that a sunscreen moisturizer may not be enough some days – the days where you see people all day long and take turns sweating in the car and inhaling the fresh crisp air conditioning from errand to errand, including park breaks and fun summer times. 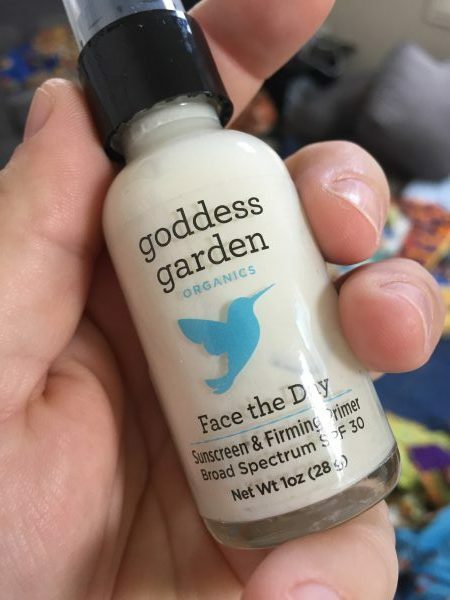 When I heard about Goddess Organics’ new facial sunscreen and makeup primer, I immediately was intrigued. Something to counteract the years of sun, to help set my beloved Bare Minerals makeup and something to help keep my face from tanning so quick in the summer? To help keep more spots and lines from forming as quick? They actually had such a good first run it disappeared before I could get a hold of sample – but was excited when I got a package in the mail with a petite but mighty bottle for me. Seriously, I cant really tell a difference – I bet this can be done with minimal or no makeup over it – but it does make my mineral powder foundation stick better than without anything under it. I never planned on being a primer person, but with sunscreen in it it just herbal-smelling awesomeness. And this little glass bottle is super powerful and super packable – where are you going for vacay this year? Because you will be selfie ready at all times. It just takes a pump to cover my face – and if its a day where makeup isn’t a priority I skip it. Because, trust me, the kinder moms at my sons school do not dress up for pickup. We’re too busy chasing siblings. I really tested this on a day out with the family – first going to a local air show (and being tormented by long lines and blazing sunlight) before covering a music festival for IE Shine On. This stuff stood up to chasing kids and walking uphill while shooing Facebook Live video. I also prayed my boys with the Kids Goddess Organics sunscreen (non-sport) and it help up great to their afternoon shenanigans. It’s hard enough to get them to walk with me in the same general direction, let alone stand still for sunscreen application, so I was glad kids sunscreen can come in a spray on version. Note – it does go on white so I still had to rub it in, but that is a job my 6 year old can do on his own while I hold his brother down and spray him. Here’s a sample of what it looks like immediately after spraying. It’s not super opaque, but enough you can see where you missed. I am completely sold on this. After years of being picky die to my eldest sensitive skin (and learning about how spray-ons can be bad, we don’t use it all the time) I am loving this product especially the sunscreen primer for the face. Trying to keep the sun exposure on the down low this year, like I am? (Unfortunately, with these kids it is already too late to not get a god tan.) then grab this primer. You in a few years will thank you. And it will end up with more selfie pics, even though you had to resort to wearing that shirt that is too short and having your waist-high son shoot a picture of you. Sweaty hair and all.